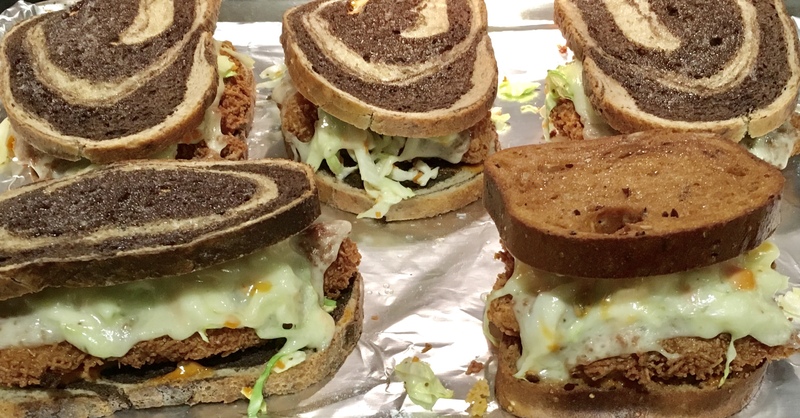 This will be the most amazing fish sandwich you’ll ever make. You can use a machine, but I like to finely slice my cabbage with a kitchen knife, cutting as thin as possible. Place the chopped cabbage in a large bowl. For the carrots, peel them to remove the outer skin, and throw that away. Continue to peel the carrots into paper-thin slivers until there’s no carrots left. Finely chop those slivers and add them to the cabbage. Add the mayonnaise, pickle juice, and celery seed, mixing thoroughly. Keep it in the fridge, covered with plastic, until ready to use. The next day, before using, taste it and decide whether you want more mayo or pickle juice. Mix it well before using. Like a classic pulled pork sandwich, the slaw will go inside! But it needs a sauce to tie it all together. Make this a day ahead as well. Tony Cacherre’s Original Creole Seasoning is a personal favorite, and it works well in this sandwich. You can find it in many stores, and online. But if you don’t have it handy, salt and pepper do the job. Combine all the ingredients in a bowl, mixing well. Keep it in the fridge, covered, until ready to use. My brother-in-law treated us to a huge stash of grouper that he caught on a recent fishing trip. I used that instead of cod the last time I made this sandwich, and the results were fantastic. I suggest you use whatever white fish is your favorite. Cut the fish into pieces that will fit the bread you’re using, and make sure they’re the same thickness. Don’t make them thicker than 1/2″ or they’ll stay raw in the middle when you fry them. Set aside. In a bowl, combine the flour, celery seed, salt and pepper and cayenne (if you’re using it). Mix well. In another bowl, crack the eggs and scramble them. Put the corn flakes in a plastic bag, squeezing the air out of it. Crush them into oatmeal-sized pieces, then pour them into a third bowl. Heat a heavy pan with a couple of inches of oil. One by one, take the fish pieces and dredge them in the flour mixture, then into the egg, and then into the corn flakes, pressing into the corn flakes to make sure they stick to the fish. When the oil in the pan is hot enough, fry the fish pieces on both sides, until cooked through and golden brown. Place them on paper towels to drain. 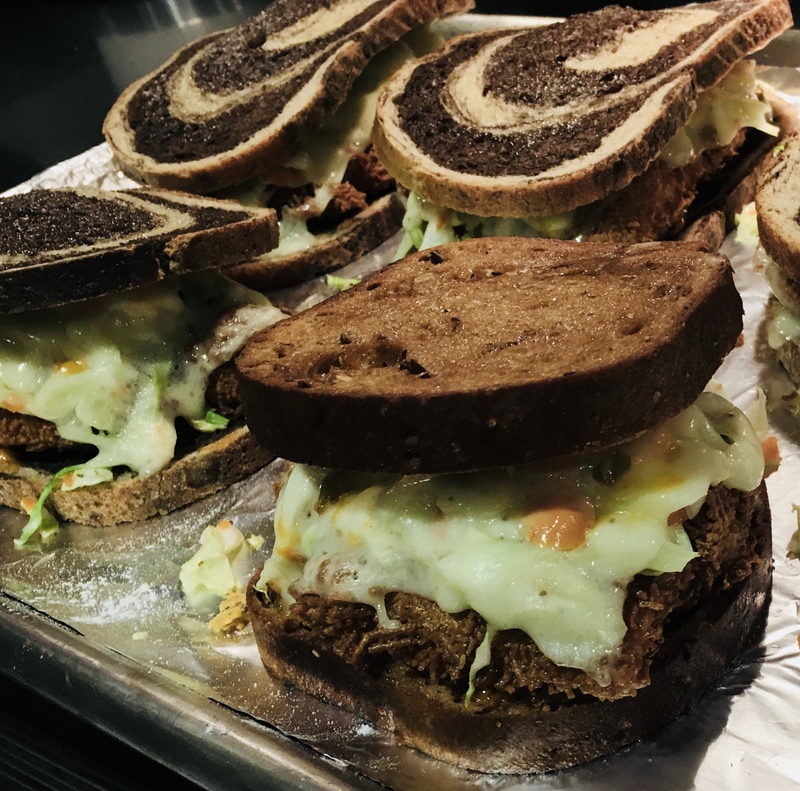 To assemble the sandwiches, take a slice of the rye bread and spread some of the sauce on it. Place a piece of the fried cod on top, then cover it with some of the cole slaw. Place a few thin slices of Swiss cheese on top of the cole slaw. Take another slice of rye, slather it with the sauce, and place it on top of the slaw, sauce-side down. Brush the top of the sandwich with the melted butter, and place the sandwich on a sheet pan. Do the same with the rest of the sandwiches. Place them in the oven and bake them until the cheese melts. Cut the sandwiches in half and serve. The gluten-free sandwich in the forefront. 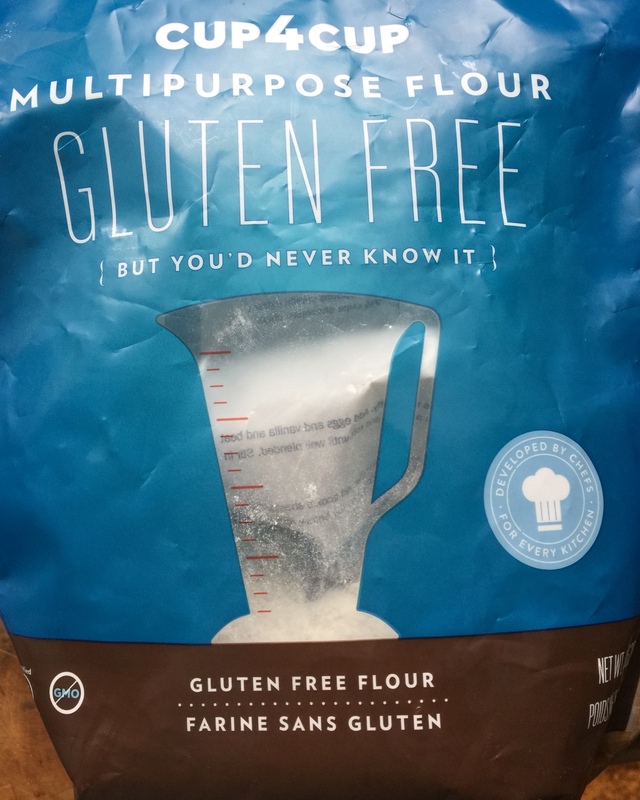 My go-to all-purpose gluten-free flour is Cup4Cup. It works really well in any dish that requires all-purpose flour. Not all corn flakes are gluten-free, and the ones that are can be hard to find. 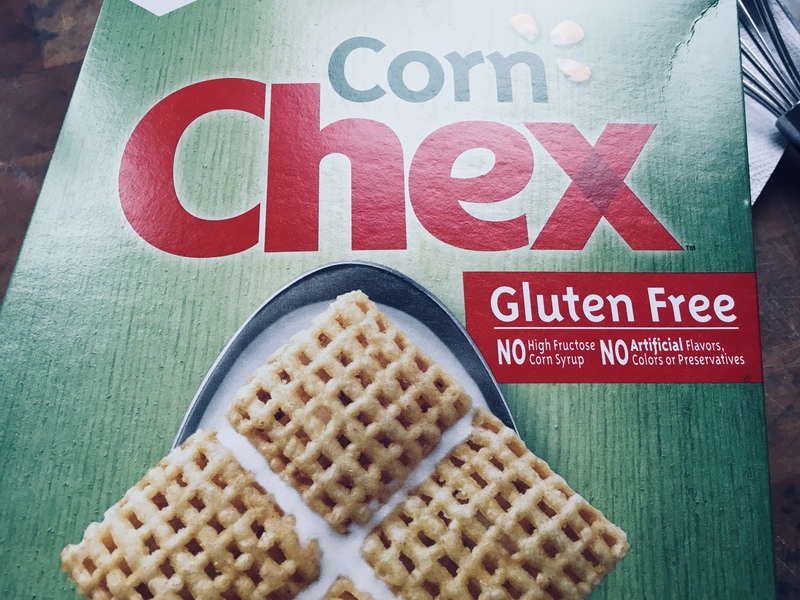 I found that Corn Chex cereal is a good substitute. It’s gluten-free, and has a nice crunch. 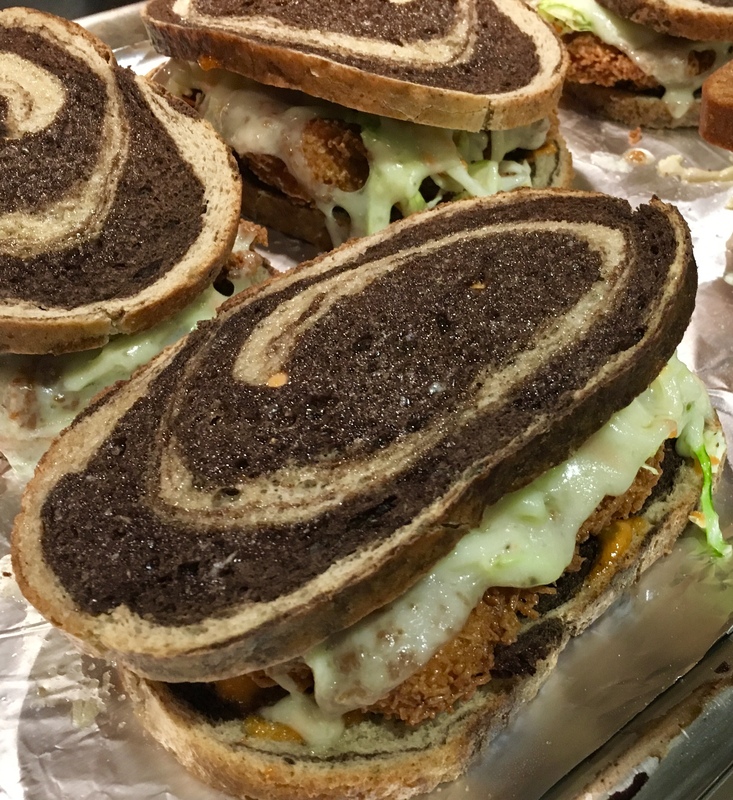 The Pepperidge Farm Marble Swirl Rye Bread is the ideal bread to use for this sandwich. 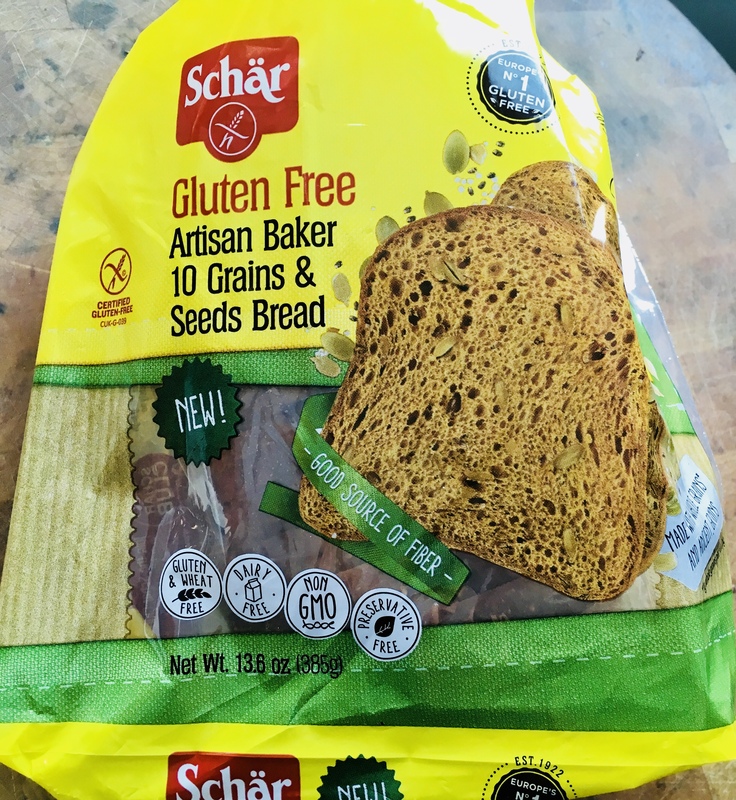 But I made a pretty darn tasty gluten-free version for my wife using this Schar bread, found in many supermarkets.